There are several types of mortgage-related stocks, and these three could be interesting to watch in the months ahead. It's an interesting time for the mortgage industry -- home prices are rising, mortgage interest rates have risen but remain at historic lows, and we're now in the busiest time of year for home sales. Several types of companies with mortgage-related businesses could be affected in the coming months, for better or worse. With that in mind, here are three mortgage-related stocks that investors should be watching. The most obvious way to invest in mortgages is to buy stock in a company that does a large amount of mortgage lending, such as Wells Fargo (NYSE:WFC). Wells Fargo services a $1.7 trillion portfolio of residential mortgages, and would love to add to its already thriving mortgage origination business if the housing market continues to heat up. The company received $93 billion in mortgage applications in the most recent quarter, and originated $49 billion. An additional $44 billion of applications was in the pipeline at the quarter's end. Mortgage originations bring in fee income, and one survey indicates the national average for an origination fee last year was $1,877. So, assuming the average mortgage amount corresponds with the average home selling price of $208,238, last quarter's $93 billion pipeline would translate into more than $1 billion in origination fee income for Wells Fargo, not including any money the bank makes from interest and servicing the mortgages. This is just a rough estimate, and origination fees aren't pure profit, but it illustrates how a summer spike in mortgage originations could significantly boost Wells Fargo's bottom line. Furthermore, Wells Fargo has been a longtime favorite of Warren Buffett, and for good reason. The bank maintains a loan portfolio of high-credit quality, and is one of the most profitable banks in the business. The revenue potential of Wells' mortgage operations make it a stock to watch, particularly when its summer results are announced. Mortgage REITs: Great if rates stay low, but that's a big "if"
There is a group of real estate investment trusts that invest in mortgage securities, and one of the most popular is Annaly Capital Management (NYSE:NLY). To understand how changes in the mortgage market could affect Annaly and other mREITs like it, you first must understand how these companies make their money. The simplified explanation is that mortgage REITs borrow money at low short-term interest rates in order to purchase mortgage securities that pay higher rates. The spread between these interest rates is the company's profit. So if the company borrows money at 2% interest and buys a mortgage paying 3.5%, its profit is the 1.5% difference between the two. To provide the high dividend yields investors want, these companies use lots of leverage when buying. Annaly currently has an economic leverage ratio of 5.7:1 and a net interest margin of 1.26%, which translates to a theoretical 7.2% return -- far below its 12.2% dividend yield. Shares are trading for about 24% less than their book value, so it seems that the market is pricing in some negativity and a potential dividend cut going forward. 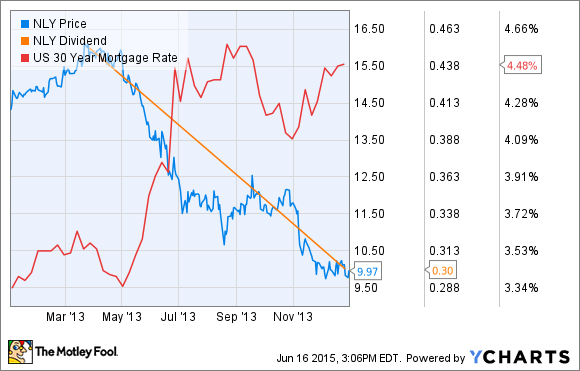 The major risk to Annaly's bottom line is rising interest rates. Since Annaly borrows at short-term interest rates, but its investments pay out fixed rates for long periods of time, the "spread" could erode quickly if rates begin to rise later this year, as most experts predict. Annaly is somewhat hedged against rising rates, and mREITs can deal with gradually increasing rates pretty well by incorporating new, higher-paying securities into the portfolio, but a rapid spike can be devastating, as we saw in 2013. Of course, if the experts are wrong and interest rates stay where they are, mREITs could be a rather lucrative investment for some time. However, any stock that pays a 12% dividend isn't without risk, and Annaly is definitely no exception. It will be interesting to see what happens to the mREITs over the coming months. Few companies have more to do with the U.S. mortgage market than Fannie Mae (NASDAQOTH:FNMA) and brother company Freddie Mac (NASDAQOTH:FMCC). These companies buy and securitize mortgages and package them into mortgage-backed securities to be sold to investors, and guarantee the payments on the underlying mortgages will be passed through to those investors. Fannie and Freddie have been earning billions of dollars per year lately, but 100% of the companies' profits are sent straight to the U.S. Treasury as "dividends" for the bailouts they received during the financial crisis. So, while the odds certainly favor the government, there is still a chance the lawsuits could be resolved in the shareholders' favor. Fannie Mae and Freddie Mac are definitely worth watching as the saga plays out -- but don't buy shares with any money you can't afford to lose. I've recommended Wells Fargo several times (and continue to do so), but I'd put the other stocks mentioned here in the "watch, but don't touch" category, at least for buy-and-hold investors. Mortgage REITs will be volatile as the Federal Reserve increases interest rates, and Fannie and Freddie are similar to buying a lottery ticket, so these stocks are best left for speculation. Whether you can stomach the risk of actually buying mREITs or Fannie/Freddie, these stocks will all have some interesting months ahead, and could be worth watching.